I’m Sick – Now What? The cold and flu season is at its peak right now and it hits hard and fast. While prevention is the best defense, what do we do when symptoms hit? Some of us prepare for the cold and flu season in the fall by starting our fire cider and tinctures to stay healthy and treat illness at the onset. Many herbalists keep their arsenal stocked and ready. But, what if you find you don’t have the herbs you need? What if the herbs you need are not readily available in your area? Once symptoms hit, you don’t have time to order online. You want relief and you want it fast. Luckily, there are plenty of herbs you can buy at your local supermarket to alleviate symptoms and shorten the duration of colds and flu. And, if taken early and often, it is possible to prevent an illness from worsening and turning into bronchitis or pneumonia. The herbal home remedies below are meant to be simple to make using ingredients that are readily available. 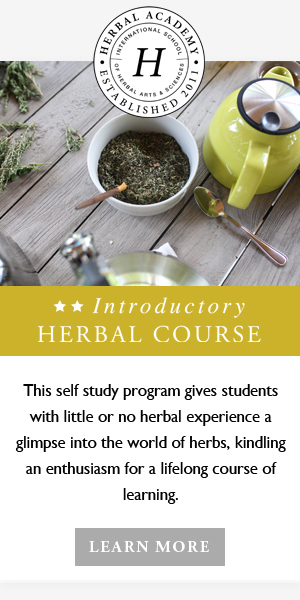 The best thing about these recipes is that they can be customized to the individual and many of the herbs can be used to address a variety of illnesses. Garlic – anti-viral, antibiotic, and antiseptic. Onion – great for coughs and raw onion keeps the respiratory tract open. Ginger – antimicrobial and anti-inflammatory. In addition to treating cold/flu, ginger is excellent for nausea and vomiting. Sage – carminative, antiseptic, and astringent – the mouth and throat plant. Used for sore throats and cough. Also used for sinus congestion. Sage should not be used when pregnant or breast feeding. Thyme – antimicrobial, antibacterial, antiviral, expectorant, and astringent. Thyme is great for respiratory infections and coughs. It is also good for the stomach and relieves gas. Cayenne powder – stimulant, anti-microbial, analgesic, carminative, diaphoretic, and expectorant. Cayenne can help prevent a cold or flu as well as shorten the duration of a cold or flu. It brings heat to the body, which can help dispel coldness. Honey – raw, local honey should ideally be purchased either at a farmer’s market or at Whole Foods or Trader Joes. Honey is antibacterial, antimicrobial, and antiseptic. Do not give honey to children under 1 year old. Lemon – high in vitamin C, lemon may help decrease the strength of the cold and flu virus in the body and reduce phlegm. Many folks use lemons to build resistance to cold and flu, and speed up healing. Herbal teas are a great way to treat cold/flu symptoms! Not only do you get the medicinal benefits, but they are also soothing, warm, and relaxing. Pour boiling water over the herb, steep at least 20 minutes, and strain. Infusions usually use more herbs than regular herbal teas and are steeped for longer periods of time. I find using a French press to be the best method of infusing and the easiest way to strain. But, any glass jar (mason or recycled food containers) and a fine mesh strainer or cheesecloth can be used. I use this tea as a base and then add some of the other remedies below if needed. Garlic can irritate the stomach. If you are drinking this often you may need to adjust the amount of garlic or eliminate it. This is another base recipe to drink daily through the duration of illness. In a 1 quart mason jar combine 2-4 cloves chopped garlic and 3-4 slices of fresh ginger. Cover and let steep for at least 20 minutes. You can strain or leave herbs in mixture. Consume warm and as needed. It can be consumed at room temperature, but not chilled. Below are some easy tea preparations for a variety of symptoms. Sage Tea (Avoid if pregnant or breastfeeding): 1 ½ teaspoon dried sage (or 3 teaspoon fresh) per cup of water. Thyme Tea: 1 ½ teaspoon dried thyme (or 3 teaspoon fresh) per cup of water. Syrups make herbs tastier and they work well to soothe cough and sore throats. Local honey is best but should not be given to children under age 1. Powdered herbs are recommended to avoid the hassle of straining from honey. Place honey and herbs into sterilized, dry jar and place into a double boiler over low heat. Heat for 15 to 20 minutes, being sure not to let the honey boil or scorch. Stir, then remove from heat and cool. When completely cooled, seal and store. Honey can be used immediately, but for a stronger honey, leave plant material in honey for two weeks before using. Begin with an herbal decoction or infusion that has been reduced to about 1/2 to 1/4 of the original amount. For example, if you usually steep 15 grams of herbs in 1 quart of water for 20 minutes, infuse the same amount of herbs in 1 cup of water for the same amount of time. Add three times as much honey (in volume) to a double boiler (or something you have fashioned yourself that acts like a double boiler). For example, if you have 1 cup of tea, combine this with 3 cups of honey. Heat gently, avoiding a simmer or boil. Stir into the tea until it is completely incorporated. Divide smaller portions into sterilized jars. At this point, you can add tincture if desired, cap jar, and shake it to infuse the added medicine. Alternate ½ inch layers of sugar and onion in a glass jar, starting and ending with sugar. You can strain out the onions or leave them in the syrup. Peel and chop the onions and place in jar. Pour enough honey to completely cover onions and leave overnight in fridge. Steam transports herbal medicine into the nose and throat. Use extreme care not to burn your face, especially with the first rush of hot steam. Herbs of choice: thyme, rosemary, sage, etc. In a large heat proof glass or ceramic bowl, add a generous handful of your herb/s of choice. Pour the boiling water over the herbs, place face above bowl, and quickly throw towel over head. Use caution: start high above bowl to avoid burning face. Inhale the steam for approximately 10 minutes or more. Dosages vary by herb, condition, constitution of a person, and herbalist preference. In general, for acute conditions, small amounts are taken frequently. For chronic conditions, dosages are larger amount taken less frequently but on a consistent basis. Always consult qualified health professional before administering herbs to children. Do not give honey to children under 1 year. All the herbs discussed are culinary herbs. But, when used medicinally, they should be used in moderation when pregnant or breastfeeding. Avoid sage if pregnant or breastfeeding as it is sometimes used to dry up breast milk. In many cases, thyme can be substituted. You can choose one remedy or use several depending on symptoms. You can also use the 2 base recipes above and treat other specific symptoms by adding other teas, honey or syrups. Lemon juice squeezed into your sage tea removes the bitterness. Sweeten your tea with sugar or honey for respiratory problems, but leave it unsweetened for digestive upset. Make an infusion of 1 cup of herbs and 1 quart of water. Infuse overnight in a French press and strain. Heat individual servings on the stove throughout the day when ill, rather than making an individual cup each time. Over-the-counter medications suppress symptoms. Taking a little time to prepare these remedies not only will help you feel better, but also aid the body in doing its job of healing itself. Ellen Demotses is an aromatherapist, and a TCM and Western herbalist. She is a member of the American Botanical Council and the American Herbalists Guild and is developing a natural skincare line.